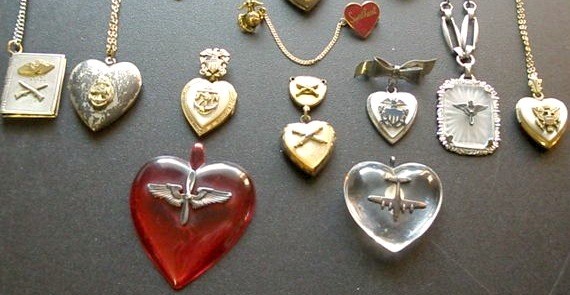 This week, we launched our new military and wartime family, and so we asked Tom Herwer, a Show & Tell regular who collects military uniforms, among other things, to tell us more about sweetheart jewelry. A keepsake, an item that recognizes a loved one, strikes a deep, sentimental chord in each of us—particularly that of a sweetheart. The popularity of keepsakes grew in the United States during the period from 1917 to 1919 as our country entered the “War to End all Wars,” and again during World War II from 1941 to 1946. 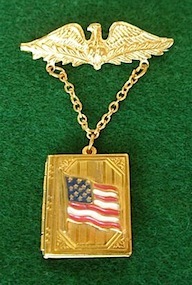 The pins, bracelets, buttons, banners, plaques, flags, posters, necklaces, and lockets gave those dealing with war on the home front a way to honor their loved ones while also showing patriotism for their country. Why was sweetheart jewelry so important? Besides the obvious display of patriotism and loyalty by the wearer, sweetheart jewelry opened up new possibilities in fashion that were in line with wartime rationing. Manufacturers of jewelry were being limited in the use of metal, and they started exploring other materials such as plastics like Lucite, as well as pearl, wood, and even ivory. One of the most popular pieces of sweetheart jewelry was the necklace with a locket. The locket had it all—beauty as well as purpose: It held a picture of a loved one close to the heart. While many emphasized this with their heart shape, sweetheart lockets can also be found in round and oval shapes—some lockets were even designed in the shape of a book. Sweetheart bracelets, generally worn by a husband, wife, girlfriend, or boyfriend of a person serving overseas, became prominent during World Wars I and II, too. I’m sad to say this practice faded mid-century, and there are very few necklace or bracelets in the market place recognizing men and women who served in the Korean or Vietnam conflicts. Love these too as I luckily picked up a couple of theses at our local Sunday flea market, very sweet pieces of history! Thanks for sharing!